Lyrics to the song Virginia Plain as recorded by Roxy Music. What's real and make believe? Opens up exclusive doors oh wow! What's her name, Virginia Plain? Virginia Plain was recorded for a single release just after the release and success of the debut album. Released 4th August 1972 one week later than originally intended c/w The Numberer and reached number 4 in the UK singles charts by 12th September 1972. The singles' success was helped by their first appearance on Top Of The Pops on 24th August 1972 exposing the band to a whole new audience and establishing many life long fans. The debut album released 6 weeks earlier took 3 weeks to get into the album charts starting at number 22 but then dropping the following two weeks heading out of the chart. The release of Virginia Plain and more significantly the Top Of The Pops appearance turned the album back round going into the top 20 just over a week after this TV appearance and eventually peaking at number 10 and having a 16 week span in the UK album charts. The band where booked into Command Studios 2PM-10PM to record both ‘Virginia Plain’ and the b-side ‘The Numberer’ (original title First Kiss) 10th-12th July 1972 . The tracks where mixed mixed on 17th & 18th July 1972. "We had just released the first Roxy Music album and our record company, Island, seemed as surprised as we were by its instant success. Their only problem there was no obvious single so they asked me if I had any other songs knocking about. I did have an unfinished song called Virginia Plain, which we quickly recorded. I vividly remember our roadie driving up and down outside the studio as we tried to record the sound of his motorbike. The song itself is about a painting I did a few years before when I was an art student at Newcastle University. I was interested in stream of conscious writing, and since the songs on the first album hadn't been very wordy, I felt it was time for a bit of verbal dexterity. I suppose nowadays any song with this title would be banned." Their single, "Virginia Plain" exemplifies his approach to writing, which freely criss-crosses between the visual and aural arts. It's based around a painting of the same name which he did years ago, and which is itself a three-way pun. The name, of course, comes from a brand of American cigarettes - and the painting consists of a large cigarette pack, with the motif of a girl, placed at the end of a plain; so the cigarettes are Virginia Plain, the girl is Virginia Plain, and the plain is Virginia Plain. How it translates into the song is rather more complex. "The painting was a sort of throwaway water colour," he says, "and the song has lots of little images and throwaway lines. The painting was done in '64, and although the song was written this year, it reflects the feeling of that time - I was up in Newcastle, living with a guy who'd helped Warhol to make the Marilyn (Monroe) silkscreens. It's a whole American Dream thing, living up there yet constantly thinking about Warhol's Factory and Baby Jane-Holzer. It's got some other things in it now Vegas, Nevada, Route 66..."
Q. How do you approach soloing, for instance? 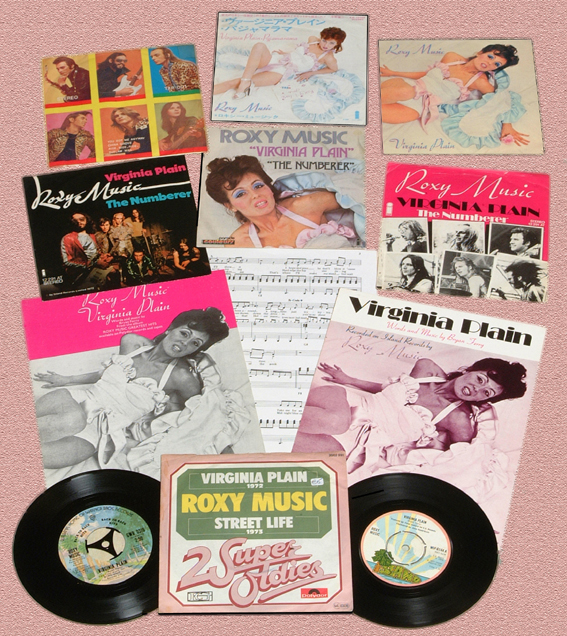 The song didn't appear on any UK album until 1977 when it was re-released as a single in 1977 backed with the second Roxy single Pyjamarama to promote Roxy Music's Greatest Hits album. It was played on most Roxy tours up until and including the Manifesto tour in 1979. It remained un-played until Bryan Ferry's 1994 tour and was introduced to his 1999 tour towards the latter part of the tour. Roxy Music played it throughout the 2001 reunion tour on most of the shows and during the 2003,2005, 2006, 2010 and 2011 dates. Bryan Ferry has also continued to keep it in the live set during many of the shows on the Frantic and Dylanesque tours.